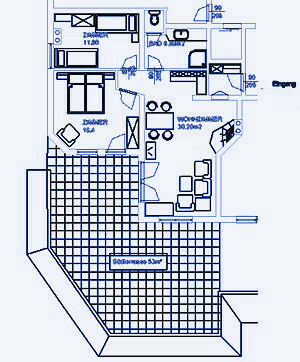 The size of our apartment 'orange' is about 65 sqm, offering enough room for up to 8 people. The apartment offers 2 separate bedrooms (for up to 3 people) and a convertible bed in the living and dining room of the apartment. The separate room 'mint' can also be booked in combination with this apartment. The bath and the toilet are separated in this apartment. Of course, the apartment offers a sitting and dining area. To get an impression of our apartment, use the slideshow below. For a virtual tour through our apartment please use the 3D- tour.